IT HAS been an extraordinary 12 months for Wicklow trio Wyvern Lingo. They have re-invented their sound and struck out on a new musical path, played to their largest audiences to date by supporting Hozier and James Vincent McMorrow on their British tours, and began the preparations for their highly anticipated debut album. The year began with that unexpected change in direction, when Saoirse, Caoimhe Barry (drums ), and Karen Cowley (bass/synth ), released their second EP, Letter To Willow, in March. In stark contrast to the folk influenced prog-rock of their debut EP, The Widow Knows, Letter To Willow was full of snappy, uptempo r’n’b rhythms and indie-pop vibes. Saoirse explains the change as being the difference between the band’s confidence and ability then, as opposed to now. There is however a kind of inadvertent link to Led Zeppelin through Saoirse’s choice of guitar. She and Jimmy Page both swear by the physically small, but sonically and iconically mighty Gibson Les Paul. The band are close friends with fellow Wicklow musician Hozier, who played his part in spreading Wyvern Lingo’s name by asking them to accompany him on his recent British tour. It saw the Wicklow women play to sold-out audiences in venues like Birmingham’s O2 Academy, London’s Brixton Academy, and the Manchester Apollo. Away from music, the band have also been a driving force in the 10,000 Missing Children campaign, run by the Bray Refugee Solidarity group. The group recently released a video, featuring contributions from Hozier, Little Green Cars, and others, to raise awareness of missing children in the current refugee crisis. 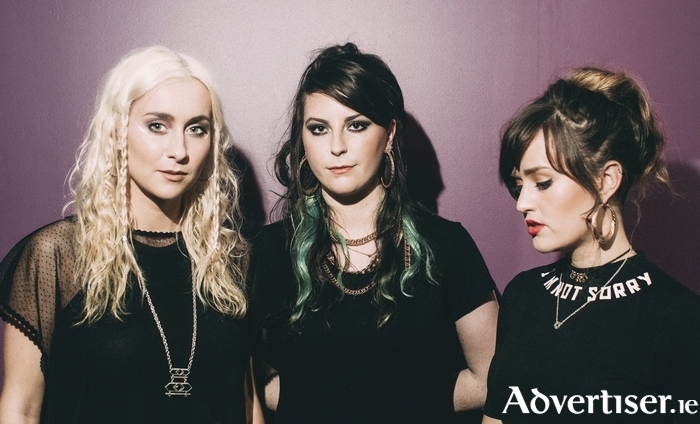 Wyvern Lingo play the Róisín Dubh on Saturday November 26 at 8pm. Tickets are available at www.roisindubh.net, the Ticket Desk at OMG Zhivago, Shop Street, and The Róisín Dubh. See also 10000missingchildren.wordpress.com.